Trinity Episcopal Church offers many different types of fellowship opportunities from volunteer work to social activities. The best way to meet people at our church is just to come and join us! Apr 17: Service of Shadows "Tenebrae"
St. Nicholas Fair: Held on the first Saturday of December - the Parish Hall is filled with Christmas items and baked goods for the season. 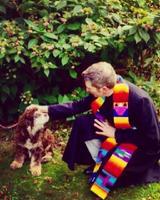 Blessing Of The Animals: To celebrate St. Francis' Day we have an annual blessing of the animals service. All animals (with their owners!) are welcome to attend. Cats, dogs, gerbils and more are all welcome to receive a blessing from God. Christmas Pageant: Our children and their families relive the arrival of baby Jesus as they act out this important event in our Christian life. This event occurs as a part of the family service on Christmas Eve. Ash Wednesday: Our service of Holy Eucharist with the imposition of Ashes is held each year at 12:00 noon and 6:00pm. It is a solemn time as we mark the beginning of the Lenten season. Wednesday's During Lent: Each Wednesday at 12:00 noon we hold a service of Holy Eucharist in the Chapel. We also offer the Sacrament of Healing during this service. Palm Sunday: The service of Holy Eucharist is preceded by the blessing of the palms. The passion of our Lord Jesus Christ is relived on this day. Maundy Thursday Covered Dish Supper: A fellowship dinner is held in the Parish Hall followed by worship. A service of Holy Eucharist is celebrated, and foot washing may be offered. The Stripping of the Altar concludes the service. Good Friday: Service of Holy Eucharist is held using reserved sacrament. A short time of reflection is followed by walking the Stations of the Cross. Easter Sunday: The celebration of the Holy Eucharist is offered at 9:00am. Bell Choir and additional special music add to our festive celebration of our Savior's Resurrection. Church school for children is provided. Easter Sunday Egg Hunt: Regardless of weather, the egg hunts are offered (inside or out) for children after the 9:00am Easter Worship services. Additional events are scheduled each year and will be listed on the Parish Calendar. We continue to collect used printer inkjet cartridges. These are recycled and the company reimburses us for them. They do not accept fax ink cartridges. Soda Cans (and bottles) are collected too! Please place them in the container near the kitchen. Each can helps offset some of our operating expenses. We also participate in the scrip program offered by Stop & Shop and by Shoprite. Gift cards are available each Sunday during coffee hour with 5% of the purchase price retained by Trinity. Purchasing something from Amazon? Use the Amazon Smile link on our "Donate" page and Amazon will donate .5% of the purchase to Trinity. Various other fundraising events are held throughout the year - check the calendar page or home page for information.